The National Outsourcing Association has held a preliminary meeting of members before the All Party Outsourcing and Shared Services group meetings begin later this year. The group will look at how the public sector can get more out of outsourcing and shared services. National Outsourcing Association (NOA) members met on August 23 to discuss suggestions to put to the group when it launches. An NOA spokesman said the initial meeting was attended by public and private sector buyers, as well as outsourcing service providers. The next stage will see the 20 MPs who will chair the group meet at the end of September, before the entire group starts meeting regularly. After delaying decision-making during a review of outsourcing contracts, the government is likely to step up its activity to cut costs. Speaking about the new parliamentary group the NOA said: "By looking at projects that have worked on time and delivered savings, the group hopes to draw out common themes that can form a best practice guide for procurement officials and government. The group will also look into projects that have not worked, and decide what lessons can be drawn from these," said the NOA. In May last year Seymour Pierce analyst Caroline de La Soujeole said government cuts might hurt outsourced service providers in the short term, but in the long term it will mean more public services being outsourced. Caroline de La Soujeole said a "golden age of outsourcing awaits", as the government turns to the private sector to get more efficiency for taxpayers' cash. She said 14% by value - some £80bn - of public sector services are outsourced, but she thinks that could exceed £140bn by 2015. 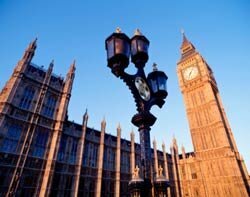 The UK public sector has had its fair share of IT disasters in the past, many of which have been blamed on suppliers. Suppliers often respond with the counter claims that government does not specify contracts properly, which leads to changes in scope and extra costs. A study from the European Services Strategy Unit, completed in 2007, reported on 105 government ICT projects which cost more than they should, over-ran or were terminated. Or even all three. The 105 projects were valued at £29.5bn and cost almost £9bn more than expected. A total of 60 programmes had cost overruns and on average cost about 30% more than they should have, 35 contracts were delayed and 31 cancelled.